After a sorting error left Escapist Editor Jordan Deam's plastic head of Modern Warfare 2's "Soap" MacTavish permanently disfigured, forumgoer mcipaulr came to the rescue by volunteering his own plastic "Soap" head for the first facial transplant of its kind. The two plastic heads, part of Modern Warfare 2's "Prestige" edition, shared a common flaw: Tragically, they were both born with two of the same sides of their face, a rare but debilitating medical condition known as visiogeminitis. But while their deformity would have consigned them to the trash heap in years past, they've now made a full recovery thanks to the miraculous healing powers of The Escapist's forums. 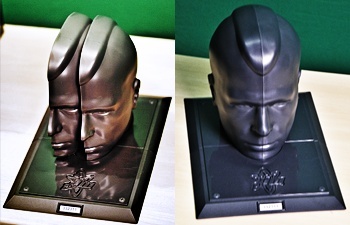 In what will likely be seen as conclusive proof of the universe's inexorable harmony and balance, Escapist user mcipaulr's plastic "Soap" head was a mirror opposite of Deam's own - one came out of the box with two left sides, while the other came with two right sides. After a brief exchange of addresses and week's time in transit, both heads are now whole and fully capable of donning the absurd commemorative night-vision goggles with which they came. "After waiting for MW2 to come out and getting the Prestige edition, I was expecting everything to be in 'Prestige' condition," said mcipaulr. Imagine his disappointment when, upon "gently opening the box and unpacking each part, I found that I, too, received the same side of Soap's face twice. ... But in less time than it takes to get a hold of Activision, [Jordan and I] were already swapping addresses. Today, I got my missing half, and my night-vision goggles are sitting proudly on my fireplace mantle, much to the dismay of my wife." Editor Jordan Deam was unavailable for comment, as he was busy skulking around the office making night-vision noises.